The last photos of December 2016 are nearly all birds. The weather was still hot and the bird baths proved to be a winner with all the birds who are staying around here. The cool of the forest also helps. The birds come into the garden from the forest in the cool of the morning and in the cool of the evening. Sometimes you just have to fully immerse to get the benefits of cool water. 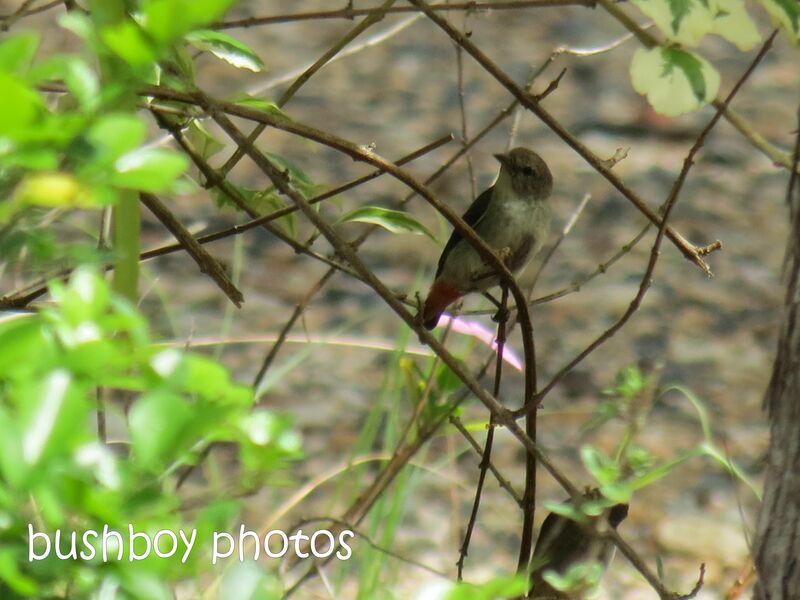 I think this was a female Scarlet Honeyeater diving in deep into the very popular hanging pot. This bloke was thinking about the bird bath and whether it was worth going in. The Brown Honeyeater contemplates his dive into the bird bath. And in he goes. What a splash for a small bird. 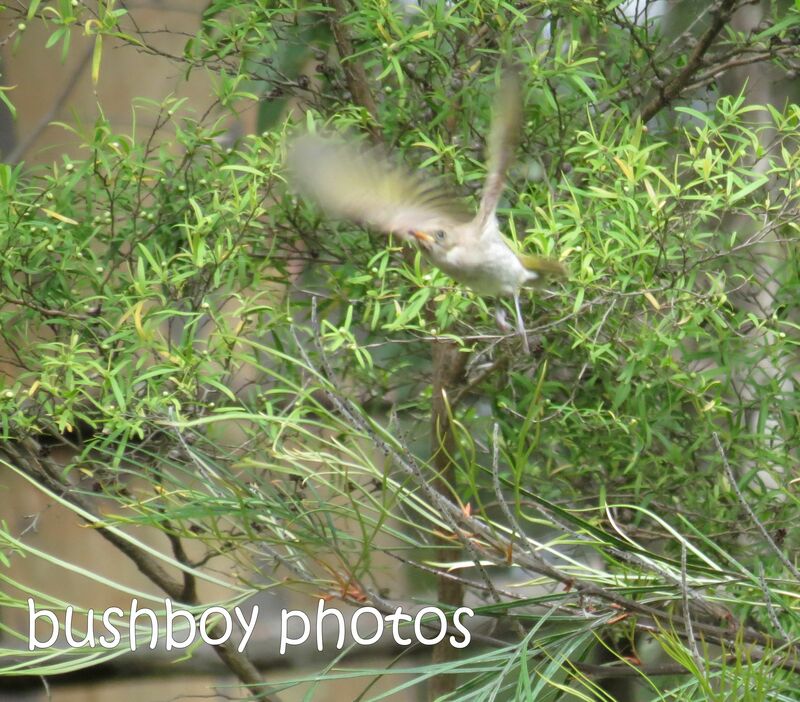 Not to be outdone, the tiny Striated Thornbill took the plunge and created a big splash. The group shot of the Striated Thornbills after their bath. One of my cutest photos ever don’t you think? On a hot day everyone arrives to get a drink. It’s heads down, bums up for the Rainbow Lorikeets. The Rainbow Lorikeets are a noisy lot, always having something to say, even if a mate lands on your branch. 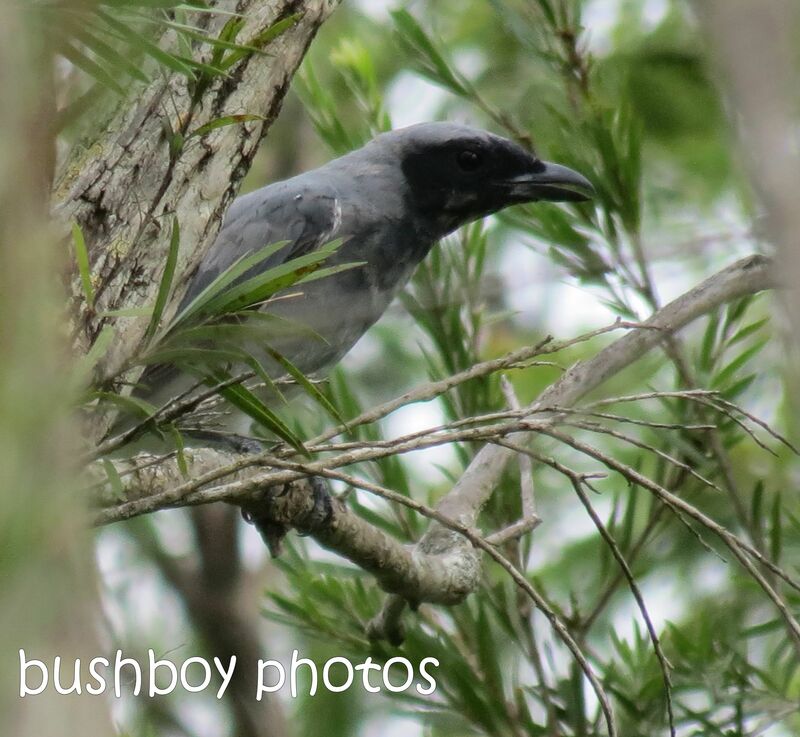 The Grey-crowned Babbler seems to defy gravity as it hopped up the Tallowwood. Once the Grey-crowned Babblers found a good spot to get a feed, the project started. There is always someone ready to give a hand. They almost have a large piece of bark ripped from the tree. Every morning I am woken to the beautiful song of a Rufous Whistler. As I walked around the garden watering those plants who were in need the most, the Whistler seemed to follow me. I bought a Hydrangea last year and have kept it in a pot on the verandah. In December I was rewarded with a beautiful pink flower. You can just see the flower of a White Hydrangea which I bought this year with flowers already on the small bush. That is the last of 2016. Now to start to sort the first photos of 2017. Happy New Year everyone. Yes. There has been some excitement around my place so far this month. Just sitting on the verandah having a cuppa one morning, the usual bird song od Spangled Drongos, Friarbirds, Fig Birds, Kookaburras and Ravens, just to name a few, changed. 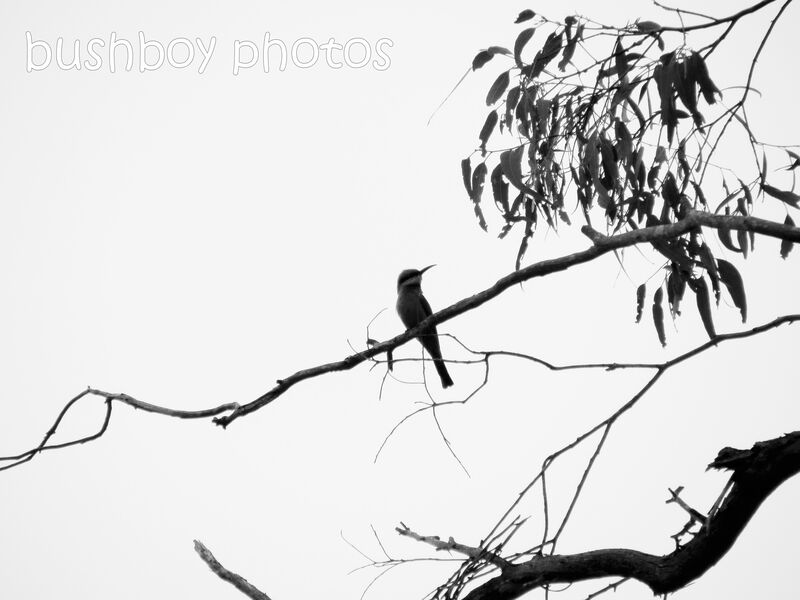 There were a few small birds whizzing around the bush near the house as well as a couple of birds who were a bit bigger. But more of the birds later. The flowers in the garden have had a bit of a lift with some rain at the start of the month. Prior to that I was feeling like the bad parent, having not much water in the dam to do a full garden watering, so I was having to select which plants I think could survive the dry a bit better than others. My best bird attractor, the Honey Gem Grevillea, hasn’t the flowers it normally has but still has bought a few birds in to the garden. 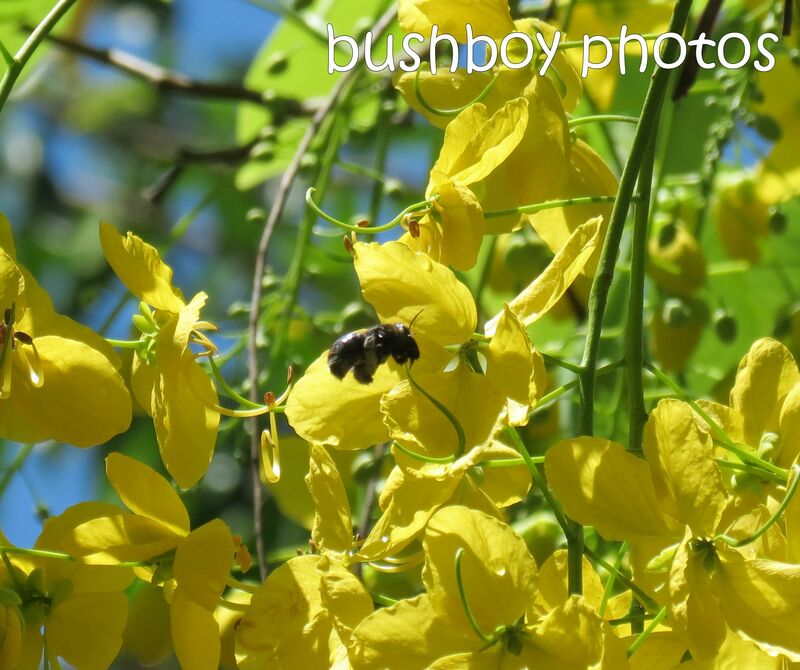 The Cassia has been quite spectacular this year with its drooping bunches of flowers seemingly cascading from the branches attracting bees. The buzzing of the bees made it sound like the Cassia was covered with bees but there was only a handful of big fat bees. 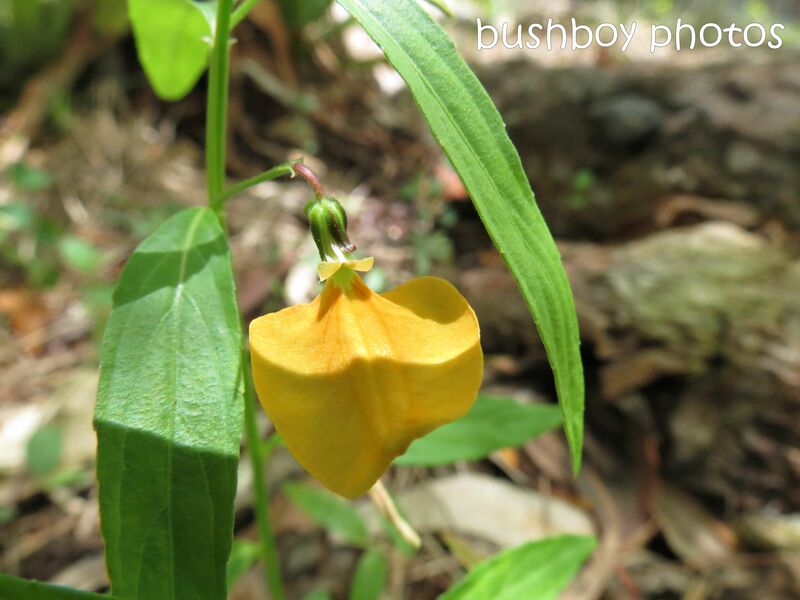 In the bush and around the garden, a little native plant has appeared. I have seen a few before but the dry then the rain seemed to make them grow in many spots in the garden as well as in the bush. The little yellow flower is about 5 to 8mms. 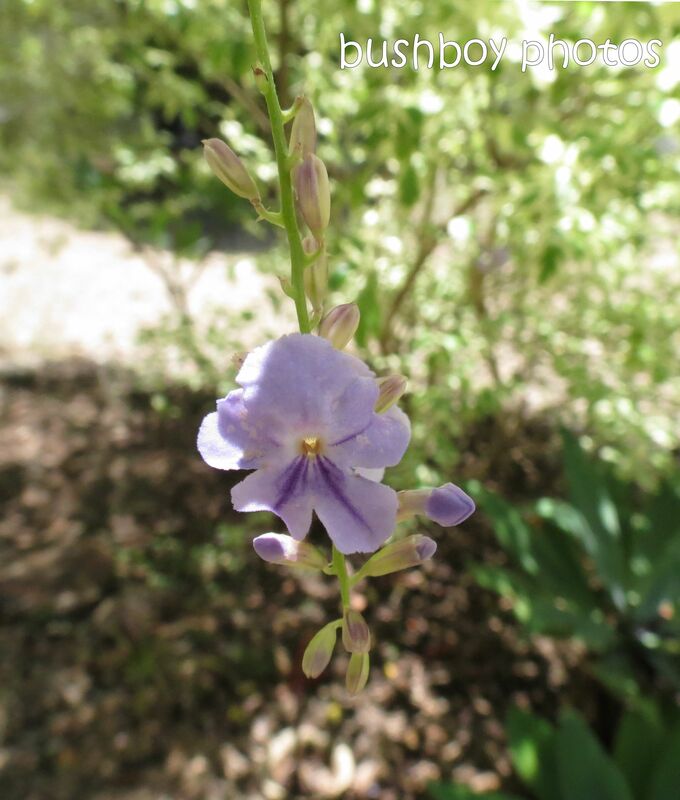 The Duranta has bunches of flowers which are followed by small orange berries. The variegated leaves are a favourite of the Satin Bowerbirds. Some small birds like to drink from the small purple flowers as well. The Mistletoe Bird was hopping around the Duranta looking for bits of nesting materials as well as examining the flowers. On the road a group of birds scattered as the car approached. 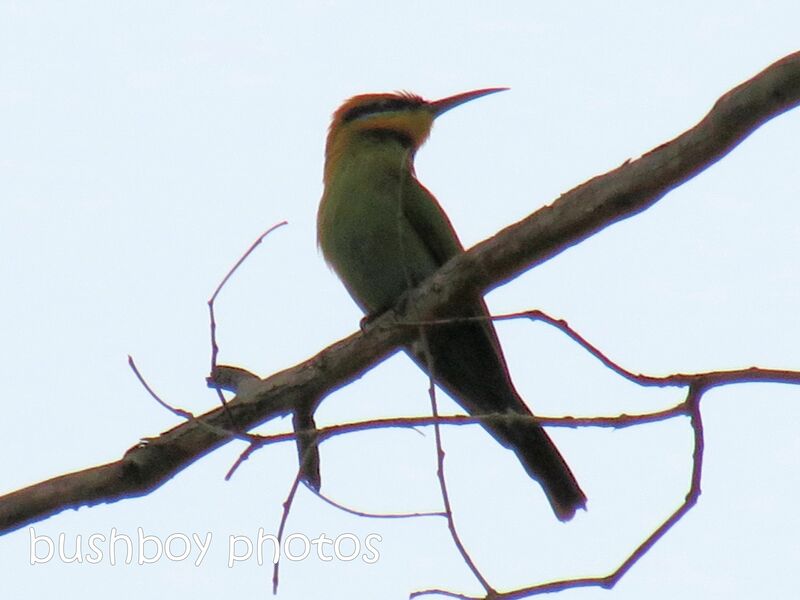 The group of Rainbow Bee-eaters flew about the trees, occasionally resting long enough to get a few quick photos in the fading light. You can see why the are Rainbow Bee-eaters! Meanwhile, back at home, the Scarlet Honeyeater was hanging on as best she could to get a snack. The Yellow-faced Honeyeaters have been here for a while now since I first saw one a couple of years ago. I love their yellow faces. The Restless Flycatchers also have made a home here in Summer. They were one of the first birds that came here when I first started to live in the bush. 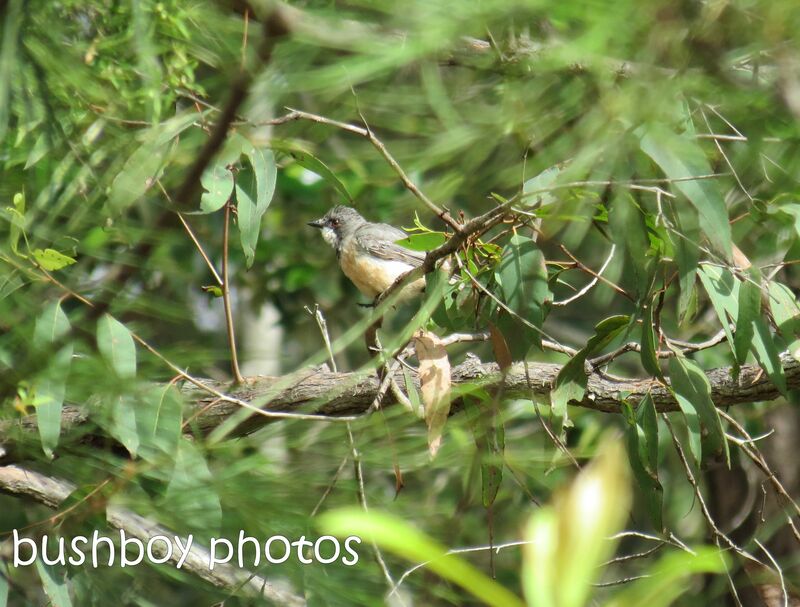 The Rufous Whistler is singing in the bush, but on this day also dropped in to the garden for a visit. OK. Remember at the start I said I had some exciting things happening. 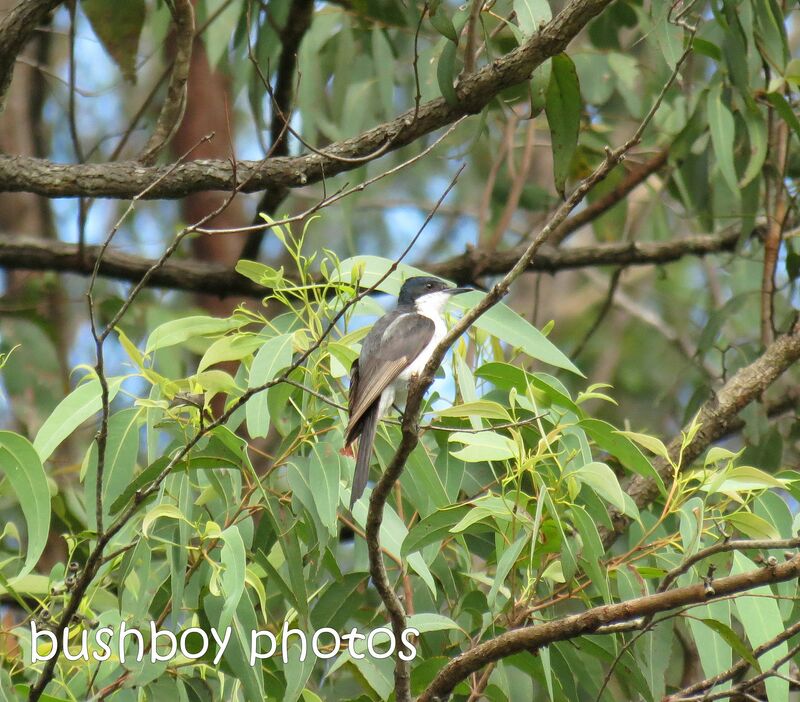 One of the new birds I have seen this year has been the Fuscous Honeyeater. I always get excited when a new bird appears. Of course the found the Honey Gem. 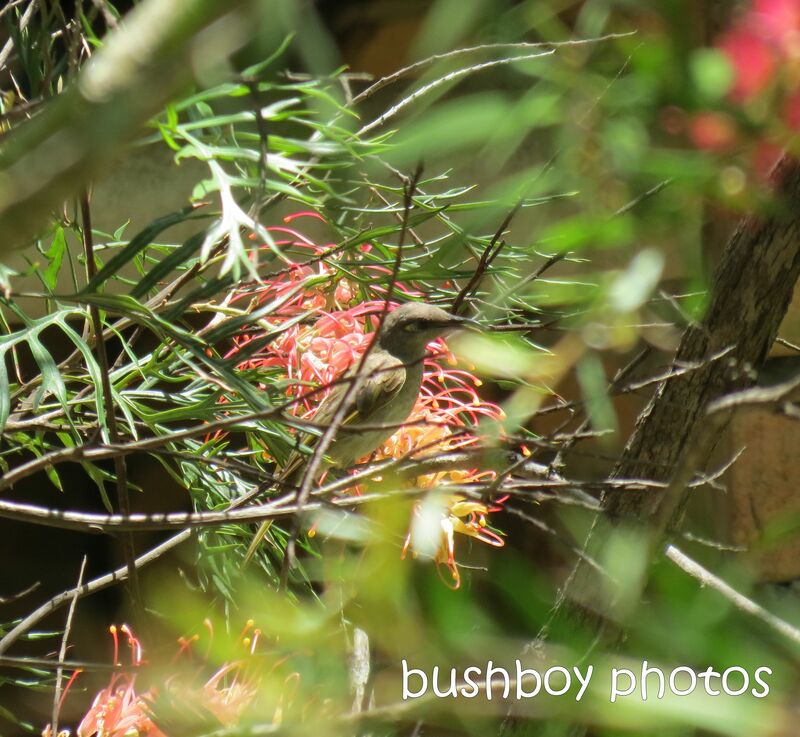 The Brown Honeyeater discovered another Grevillea in another part of the garden. This is also a favourite of the Scarlet Honeyeaters as the bigger birds don’t drop in for some nectar here very often. 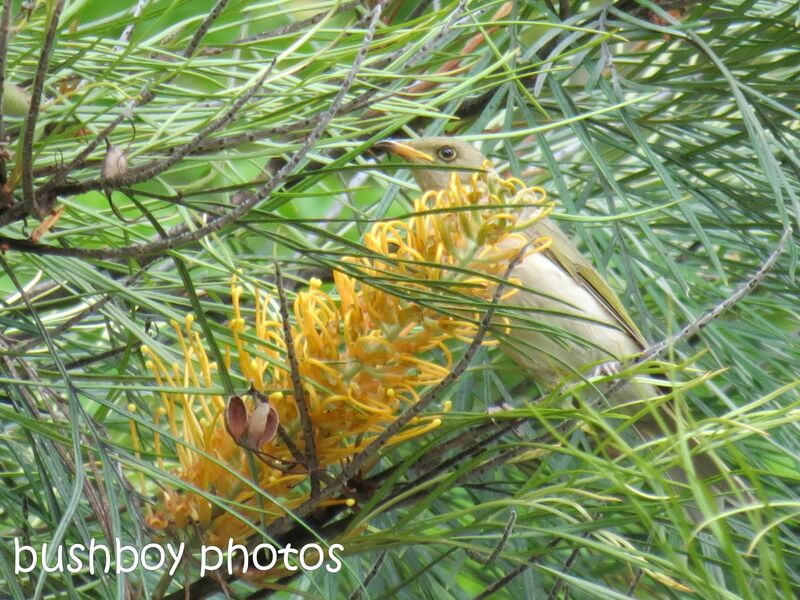 This is the first time the Brown Honeyeater has been seen at my place as well. ….but not before the most exciting news of all. 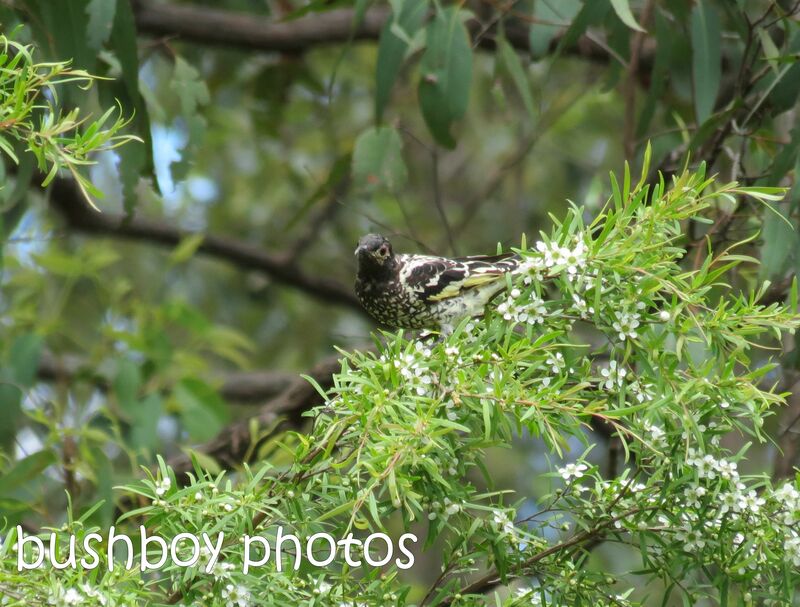 One quite rare visitor to my place has been a Regent Honeyeater. When something like this happens a lot of people like to know so it is always good to let the folk at Birdlife Aust know when you come across something special. Many thanks to Twitter mates @DOCTOR_Dave and @caroproberts for their help in identifying the birds and butterflies I had trouble identifying as well as everyone else who also helped. I hope I get some more new birds at my place in 2015 to add to the 88 I have already discovered.